one's back, and explode on a timed delay. Damage wise, the Rope version of the Delayed Molotov is exactly the same as the normal one, but their usage is quite different. 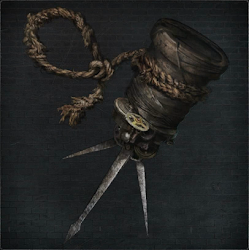 Like traditional Rope Molotovs, instead of throwing them in front of you, these are dropped behind your character, only now when they hit the ground you have a short 1.5 second timer before the explosion. With normal Rope Molotovs you never really want to be locked on to your target, but because you now have a timer to work with, you can lock on, start moving away, drop one behind you, and then keep backing up past the explosion's radius safely. This new tactical avenue allows you to create a guessing game for any other player you are facing; by mixing up throwing normal Molotovs, Delayed Molotovs and Rope Molotovs while moving around it will be difficult for opponents to pin you down. Where as normal Delayed Molotovs excel for setting traps where you are already in position and looking to ambush players coming after you, Delayed Rope Molotovs are better used as a means of deterring them from chasing you. Any time you round a corner or go through a doorway with a player close behind you, drop one of these once you're out of their sight; unsuspecting players that follow quickly behind you and get caught in the blast, and even if a player does realize what you're doing, they'll have to wait for the explosion, which gives you time to set up your next move.